Two months ago while exploring the NoBo Art District’s website (NoBo: North Boulder), I saw “Beauty of the Beasts” again – the digital version. The massive blue gorilla had been unforgettable. Now I could seize the opportunity to connect with the artist and find out how she makes a quilted picture – if she was willing to share her secret. Two weeks later I met Barbara Yates Beasley at her cheery studio in her home in Boulder. Neatly folded and organized fabric of every color imaginable filled tall wooden book shelves along one wall. On the ample table that filled the center of the room sat two sewing machines, a roll of fusible bonding, a large piece of paper with the outline of a dog, swatches of fabric, and a computer. The dog was a work in progress, and Barbara was happy to share how she creates pictures from fabric. Barbara Yates Beasley begins her fabric collages by outlining on a computer key areas where shading changes in a digital photograph. The resulting print becomes her pattern. Barbara starts her work with a photograph. Her favorite subject: animals. 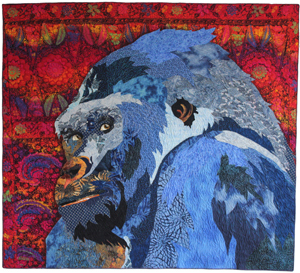 Many of her art quilts – or fabric collages, as she prefers to call them – are based on pictures she or friends have taken at zoos. In this case, a client had commissioned Barbara to make a fabric portrait of his wife’s dog. Barbara opened the image he had sent her in Photoshop, where she studied the dog’s shading. 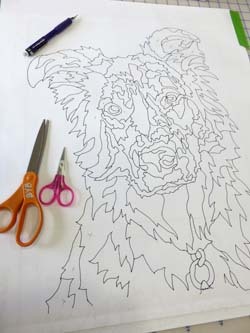 Using a digital pencil, she outlined the areas where the dog’s color changed and where shadows fell. The process reminded me very much of what happens in creating a design for stained glass. In this case, however, Barbara didn’t have to worry about structural integrity. Instead, she had to consider where she would need to use different fabric colors to create shading. Only the dark outlines, created on a digital layer over the photo, went to the printer. At Kinko’s she can request prints up to 36 inches wide and as long as she wants. For her current project she had come home with two mirror image prints 16 x 20 inches. 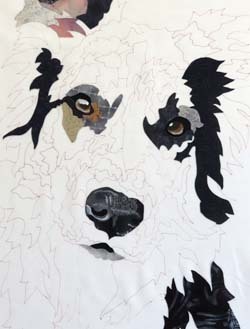 Varying colors of fabric creates shading and details in this image of a dog, a work in progress by Barbara Yates Beasley. Over the first print Barbara laid muslin. She carefully traced all the lines of the pattern and then hung the muslin on the wall near her worktable. The muslin was to be the back of her fabric collage. Now the bonding had become the pattern for the fabric. Barbara cut out the fabric around the shape of the bonding, turned to the muslin on the wall, and positioned the newly cut fabric on the matching area of muslin. Again the bonding she had applied worked like removable tape. She would repeat this process until the entire area of muslin was filled with fabric that artistically reinterpreted the original computer image. 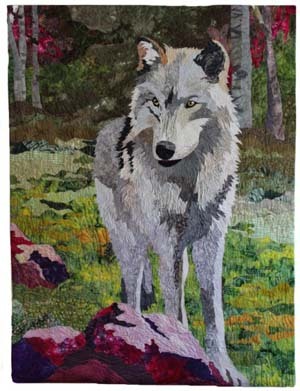 The wolf pictured at left is not the final work that was in progress while I was visiting Barbara’s studio. It does illustrate, however, just how effective shading with fabric can be and how much detail is possible in a fabric collage. Barbara likes to leave her work on the wall and come back to look at it after a couple of days. If the play of colors doesn’t seem to look quite right, she can make changes. When she is satisfied with the effect, she takes down the muslin and irons her collage. Heat makes the bonding permanent, as long as the art isn’t washed. Because Barbara’s collages become wall hangings, the technique works. Before studying her art, I was only familiar with the applique´process that secures one piece of fabric on top of another. Examining the collages on the walls of her home, I realized that the absence of heavy applique´ stitches allowed my eye to believe the shading she had created. One color seemed to flow into the next. When all of the fabric is in place and pressed, Barbara’s work is still far from complete. After placing a thin piece of cotton batting behind the muslin, she begins adding the stitching that will give her design texture plus extra color and detail. Observing the many animals that she has captured in fabric, I admired how her stitching follows the direction in which their fur would lie. This attention to detail enhances the credibility of her creations. Barbara changes thread color frequently on her sewing machine as she moves from one area of her collage to another. Her favorite thread is King Tut by Superior. It creates a minimum of lint and the colors are beautiful, she told me. She owns all 133 colors of the King Tut line. And that’s only part of her entire thread collection. 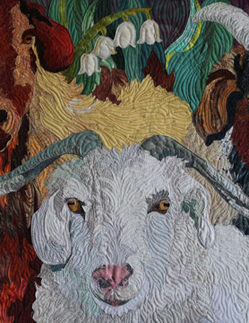 “Spiney” by Barbara Yates Beasley tests the boundaries of contemporary art quilts . After sewing countless lines of stitching on “Spiney,” pictured at left, Barbara painted thin white lines to emphasize the porcupine’s quills. 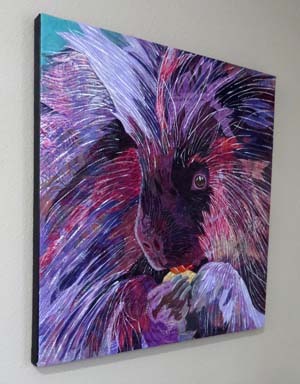 Using acrylic paint for accents and fine detail is just one way that Barbara has consciously begun to press the boundaries of what fiber artists accept as an art quilt. Notice that “Spiney” doesn’t hang loose on the wall. It’s mounted on canvas — the kind made for great art. Barbara painted the edges of the canvas black and adhered her finished work to it with a gel medium. That step automatically eliminates “Spiney” from many quilt shows, where all work must be able to hang from a rod through a fabric hanging sleeve on the back of the quilt. For now, she has her own exhibit at Bas Bleu Theater, 401 Pine Street, in Old Town Fort Collins. You can drop by to see her “Animals with Attitude” in the lobby any time the box office is open from now until April 25. Box office hours and a map appear in the lower right corner of Bas Bleu’s home page. Better yet, meet Barbara herself at her exhibit’s opening reception on Friday, March 6, from 5:00 to 7:00 p.m. Here are more links you might want to check out: Barbara’s website and Barbara’s Facebook page. There you can find out about classes she offers, link to the art associations she belongs to, and see more of her work. Her website includes nearly 50 photos of her work, past and present. Personally, I’m looking forward to watching how her art develops as she continues to press the boundaries of the contemporary art quilt. Have you checked the 2015 Calendar of Art Shows and Festivals here on Handmade on the Front Range? The calendar currently runs through August. When event organizers have their fall dates finalized, the calendar will run through the end of the year.